This species was described more than 150 years ago, but is still a mystery to many scientists. 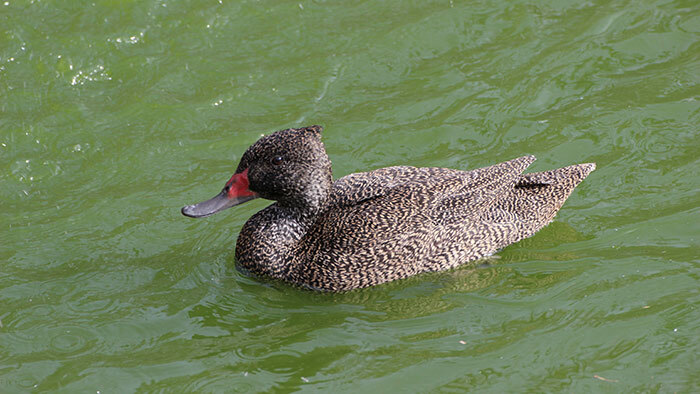 It is thought that it is the sole survivor of an ancient waterfowl lineage. Freckled ducks are specialist filter feeders that mainly eat small crustaceans, mollusks, insects, larvae, sponges, and tiny fish. 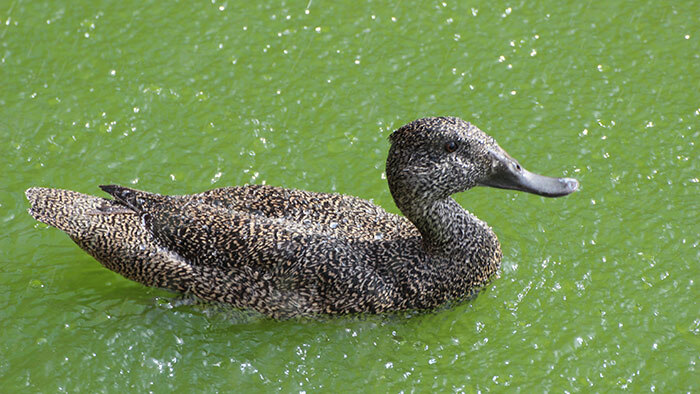 Found only in Australia, these ducks live in open lakes, swamps, and marshes that have abundant vegetation. They will live in brackish or freshwater, but not saltwater. Freckled ducks typically nest from June through December, but their breeding is determined by flooding, and if there is a lot of flooding, they will breed year-round. Nests are built from interwoven twigs and stems, usually in remote, shallow swamps. This species of duck is not considered threatened. There is a relatively large population and their numbers are stable. These ducks are large and heavy with long necks. Freckled ducks are most active at night. Males and females look similar with dark gray-brown plumage that is freckled with whitish or buff markings. They have a triangular shaped head with a crest and a large bill. The difference between males and females is that the base of the male’s bill becomes bright red during breeding season. The vocalizations of this species are very quiet. The male sounds like a snort or a grunt, and if the female is disturbed while on a nest, she makes a cat-like hissing sound. Freckled ducks live in groups of 10 to 100 individuals, but during the non-breeding season, they can be seen in large groups of more than 1,000. As ducklings, freckled ducks are unpatterned and look like young swans.